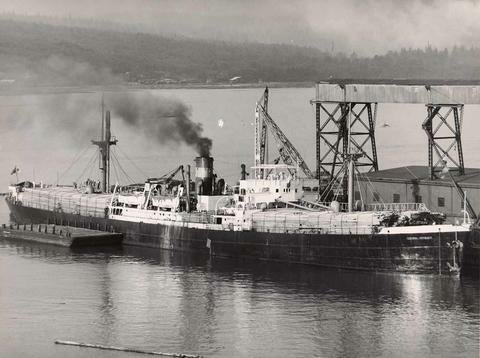 ItemLF.00629 - Norwegian freighter "Brandanger"
ItemLF.00634 - Unloading automobiles from MS "Oakworth" Vancouver, B.C. ItemLF.00635 - Silk shipped from the Orient to Vancouver on the SS "Achilles"
Photograph depicts "Federal Voyager" at dock. Freighter with bow end facing right, name "FEDERAL VOYAGER" visible on hull; deck stacked full of lumber; cranes in background behind ship.